J. B. Michaels, a member of the Society of Children’s Book Writers and Illustrators, has written stories since he was in fourth grade. He is a history teacher and department chair who loves his job. JB Michaels captures the spirit of Christmas in The Tannenbaum Tailors and the Secret Snowball. Ever wonder what is happening inside your Christmas tree? What is nestled within the pine branches? What wonders are hiding behind the ornaments and lights? Hidden tiny elves, known as the Tannenbaum Tailors, that’s what! These little, but powerful creatures are hard at work checking the spirit levels of each home. Tailoring and keeping safe every tree. However, the Christmas of 1987 is one the Tannenbaum Tailors will never forget. During that fateful season, Christmas was almost destroyed forever. Captain Brendan and his faithful Tailor Team fight to keep the spirit of Christmas alive. They must protect the Snowball at all costs! They must save Christmas! JB Michaels’ love for children and family is reflected in his writing. The Tannenbaum Tailors and the Secret Snowball depicts childhood lessons regarding the consequence of actions and self sacrifice. It also portrays the importance of family, responsibility, and challenges experienced when coming of age. The narrative is imaginative and magical, and filled with tons of adventurous action. The short, yet captivating chapters are perfect for young readers. The story includes Christmas theme gadgets: glimmer goggles, gift box cars, Icicle ships, magical snowballs, and a small fantastical civilization within the known real world. These extraordinary tidbits create a whimsical setting that releases the imagination. As the classic conflict of good versus evil heightens, it is sure to keep the hearts of young readers pounding with anticipation. The ending holds true to the spirit of Christmas; peace on earth, goodwill towards men. Yet, you sense a deeper resolve in the characters, and you are well aware that more adventures are out there waiting for the Tannenbaum Tailors. The Tannenbaum Tailors and the Secret Snowball, Volume 1 is a children's holiday adventure novel written by J.B. Michaels. Commander Brendan was hard at work on the bridge of the Icicle during their trial run, but it was nearly Christmas Eve, and his team had a challenging tree to take care of this year. The Tannenbaum Tailors are tree elves, dedicated to the care and well-being of the Christmas trees that can be found at this time of year in almost every house. This year, their tree was located in a house where the inhabitants were mourning the death of a young boy's grandfather. The Tailors could tell that the tree's lights hadn't been used very much as the tree's needles were still filled with water, and they feared the tree might not make it to Christmas Eve. Brendan's concerns were temporarily put aside when a series of tree fires were set by evil elf-like creatures who were determined to destroy Christmas forever. Can Brendan and his Tailors keep the Secret Snowball safe until Santa arrives? 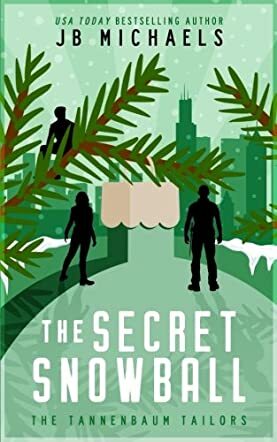 J.B. Michaels' holiday action and adventure novel for children, The Tannenbaum Tailors and the Secret Snowball, Volume 1, is an exciting and fast-paced tale filled with elements of science fiction and and the fantastic tech gear found in James Bond thrillers. I loved seeing how the Icicles worked and think it might be grand to have a Glimmerlift of my own. Along the way, Michaels uncovers a fairly plausible genesis of the Naughty and Nice list, which I always had some questions about myself. One of the best things about the Tannenbaum Tailors is their sense of being a team and pride in working with each other to keep Christmas alive. There's a lot to like about The Tannenbaum Tailors and the Secret Snowball, Volume 1. The action is non-stop, and the story is a thrilling one. While it's geared towards readers past their first primers, I think it would make a perfect read-aloud story while sitting by a Christmas tree that just happened to have its lights on. It's most highly recommended. The Tannenbaum Tailors and the Secret Snowball (Volume 1) by JB Michaels is a children’s Christmas story. This is a cute book that revolves around the theme of Christmas and goodwill, and the conflict between good and evil. These classic themes have been given a slightly modern twist in this tale as we learn about the Tannenbaum Tailors who are the elves responsible for the Christmas trees, and Captain Brendan who is overseeing the protection of a special tree that contains the power of Santa. As these folks fight the Spiritless elves — the mean folks bent on destruction and mayhem — they also restore the joy and true spirit of Christmas in the process. The Tannenbaum Tailors and the Secret Snowball is a fun and entertaining read. Although it is based upon the usual battle between good and evil during the season of Christmas, the book employs a novel approach that makes it interesting. JB Michaels obviously feels strongly about the season of giving, and the plot is freshly woven and well written. I loved reading about the Tannenbaum elves and their adventures and, indeed, this is a book that both adults and children are sure to enjoy. The so-called Spiritless elves are equally entertaining to read about as they represent the bad or evil side, and the fight between good and evil is well depicted. I am certainly looking forward to reading more about the Tannenbaum elves in the next volumes.